Crossposted here from Kubrick on the Guillotine. A soft-core fantasy of a high school girls’ locker room, ripped out of its dreamy sensuality by a sudden stream of menstrual blood running down a thigh in close-up. A plain-faced young girl with strawberry blonde hair, castigated and repressed at every turn. A prom queen in a sparkling tiara drenched in pig’s blood, transformed in a few moments from softly feminine ideal to demonic harpy. Fiery vengeance of mythical proportions raining down indiscriminately on the heads of the cruel tormentors, the evangelical mother, the kindly schoolteacher, all at the same time. 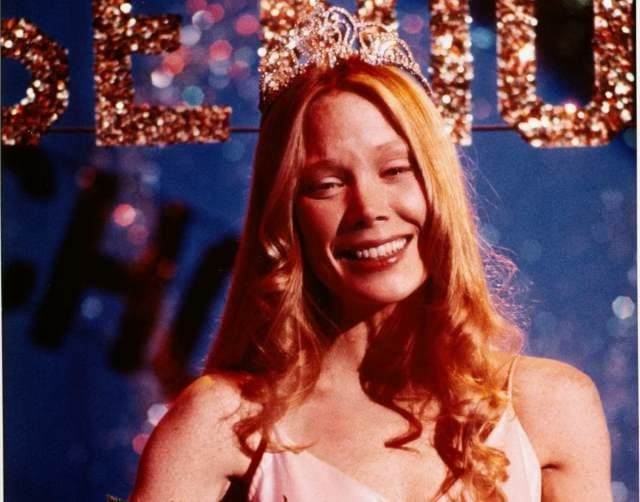 A series of baroque, quasi-religious images are called to mind when one thinks of Brian De Palma’s singularly unique brand of horror film,Carrie. De Palma’s lurid Freudian sensationalism and Hitchcockian grandstanding aside (borrowing wholesale the musical accompaniment and shower scene), his style here seems to be as wracked by hysteria as his characters. Even the visual space is delineated against Carrie; she is frequently pushed to the corners of the screen, physically distanced from the others. Not one to be accused of subtlety, De Palma’s camera leaps and whirls schizophrenically, breaking into split-screen at the moments of Carrie’s undoing. Yet the deliciously sadistic, extended slow-motion of the penultimate prom scene is crafted to suspenseful perfection; in watching the young girl lifted up with feelings of elation and belonging only to be cruelly humiliated.